Most of the time we hear that vegetables, fruits, pulses and dairy are good for our health, but there are some foods that might not be suitable for us as we age. Raw vegetables. If your teeth are not sturdy or you cannot chew well, raw veggies are not for you. Replace with cooked vegetables, purees and soups. Whole pulses. 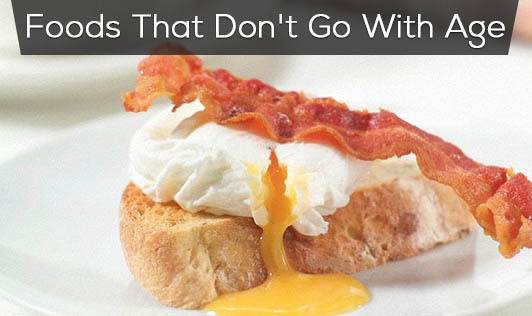 They can cause gas, bloating and / or stomach pain. Replace with sprouts and cooked dals. Milk. It can cause indigestion. Switch to curd or buttermilk. Caffeine. Beverages or foods with caffeine can disturb sleep or increase blood pressure. Change over to green tea or herb tea. Spices. Chillies, pepper, etc might irritate your gut. Reduce spices in your meals. Meat. Some meats might be tough to chew and digest. Choose what's good for you. Salt. Sodium rich foods like salt, processed foods, etc can affect your blood pressure and bones. Reduce salt in the diet. Greasy foods. Oily foods are more difficult to digest and can also bank calories which are more difficult to remove as you age. Replace with grilled, steamed or boiled foods. Alcohol. Even if you are used to taking a drink regularly, your blood pressure and sleep might not co-operate with your alcohol intake, as you age. Keep your age and health condition in mind when you choose foods. Get help from the dietitian to decide what suits you best.